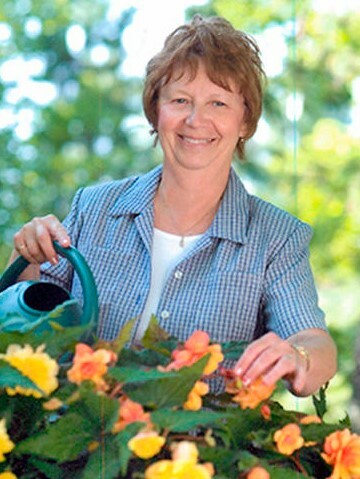 Cindy (Cynthia) Lynn Anderson, 69, of Twig, MN took the hand of God and left this life on Thursday, April 11, 2019 at Bethesda Hospital, St. Paul. She was with her family as she lost the battle against influenza, pneumonia and multiple other lung infections, that was waged in her transplanted lungs. She fought courageously to enjoy the life she had after having a lung transplant on August 7, 2013. Cindy was born on October 10, 1949, the only child of Fred and Ruth Childs. She graduated from “The Old” Central High School in 1967. She met her life long companion, Duayne, in July 1966. They married on March 21, 1970 and they remained at each other’s sides for almost 53 years. Their 49th wedding anniversary was celebrated while she was a patient at Bethesda. Cindy was a nurse at St. Mary’s Hospital in Duluth for 43 years where she cared for patients in the Diabetic, Oncology and Outpatient floors. Her passion was growing and selling her beautiful flowers at her greenhouse, The Petunia Patch, where she nurtured plants from seedlings to the flowers she sold for 30 years. Every Spring, her friends and family would gather and enjoy helping with transplanting, watering and trimming the array of color she grew as they escaped, for a while, the snow outside the greenhouses. Cindy loved creating beautiful quilts to share with those she loved. Her beautiful creations will be a lasting reminder of her tender loving heart. Cindy and Duayne chipped away at their bucket list, especially after her lung transplant. They shared many wonderful experiences as they traveled together. They were blessed, last September, with a trip to Banff, Canada where they were awed by the beauty. The family cabin on Lake St. Croix was her sanctuary where she found peace and family fun, especially on her favorite holiday, the Fourth of July. Cindy was preceded in death by her parents, Ruth and Fred. She is survived by her devoted husband, Duayne, and her children Jennifer (Sean) Donkin, Karen (Jamie) Mehle, Justin Anderson, sisters-in-law Kathy Gould, Claudia Johnson and Jean Anderson, dear extended family member, Heidi Brown and many close, loving friends. She loved her five grandsons, Blake, Nolan, Braden, Garret and Jackson with all her heart. There was nothing more important to Cindy than her family, gathering them whenever possible, to share her love. Visitation will be held at Cindy’s church, New Life Covenant Church, 5309 Dickerman Road, Saginaw on Wednesday, April 17 from 5:00 until 8:00. A celebration of Cindy’s life will be held on Thursday, April 18, 2019 at The Vineyard Church 1533 West Arrowhead Road, Duluth, MN. There will be visitation from 9:30 until the 10:00 service. Per Cindy’s request, there will be lunch served after the service. Burial will be at the Grand Lake Township Cemetery at Twig, MN. The family would like to thank all of the staff including the nurses, aides, doctors, housekeeping, dietitians and respiratory therapists at Fairview Hospital, University of Minnesota and Bethesda Rehabilitation Hospital, St. Paul who made every effort to help Cindy recover from the illness that infected her lungs and to make her comfortable during her 77 days of hospitalization. Arrangements by Williams, Lobermeier, Boettcher Funeral Home. Special thanks to Paul Bergquist, our neighbor and friend, for his compassionate assistance with the arrangements.